Key members of SCC at the opening ceremony. The “Hand of Hope” helps stroke victims to train the hand-brain co-ordination. A cute robot called Zero Carbon Boy can interact with visitors. In recent years, we often hear news on driverless automobiles and virtual reality (VR), and how smart city products improve the quality of life with information technology. But what exactly are they in real life? 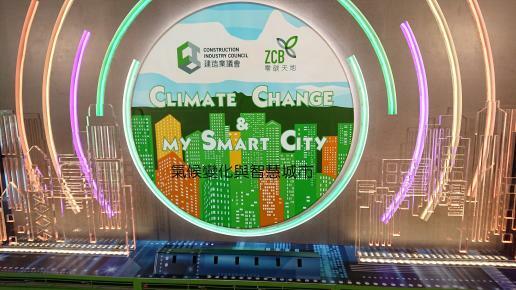 The new Climate Change and My Smart City Experience Centre recently opened in the Zero Carbon Building (ZCB) in Kowloon Bay enables people to experience these new technologies. There are four thematic centres: "Climate Change", "Smart City & Sustainable Built Environment", "Smart Living" and "Health & Well-being". The Experience Centre with a guided tour is now open to the public for free until the end of this year. All you need to do is to make an advanced booking. I am pleased and proud to see that many exhibits are the results of local research and development, they are also the evidence of cooperation amongst the government, industry, academia and research sectors. Some of them are the results of our Smart City Consortium members. The opening ceremony at the ZCB in early June was crowded. I did not have chance to experience each exhibit, but here are a few of the brand new technologies. It is estimated that there are at least 700,000 diabetics in Hong Kong, of which 40 per cent have diabetic eye disease which can eventually lead to blindness. Unfortunately, there are no obvious symptoms at the early stage. Visiona MedTech, an incubatee programme at the Science Park, has combined intensive learning and artificial intelligence to develop diabetic retinopathy screening technology. By taking pictures of the retina and uploading to the central system, people will be told whether they are likely to have diabetic eye disease, and its seriousness. It is fast and convenient and, most importantly, non-invasive. From the long waiting queue for testing on that day, we can conclude that there is a substantial demand for such technology. In recent years, Hong Kong patients suffering from stroke are becoming younger. Stroke may lead to impairment of hand activity. The "Hand of Hope", developed by the Polytechnic University and Rehab Robotics, was awarded the Honorary Award in the International Exhibition of Inventions of Geneva. Through detecting the patient's own electromyography signals, the "hand" helps the patient to train the hand-brain coordination. This "rebuilds the connecting nerves", and wakes up other dormant brain cells to take over hand activity function from the damaged cells. This technology has been adopted by a number of public hospitals and rehabilitation centres in Hong Kong. It has also been certified by the European Union and exported to more than 20 countries and regions, such as Germany. Another local product is a radio frequency identification (RFID cane navigation system for the visually impaired. It was awarded the Gold Award in the International Exhibition of Inventions of Geneva last year. This is an invention of the Hong Kong R&D Centre for Logistics and Supply Chain Management Enabling Technologies. An RFID reader is embedded at the tip of the cane of the visually impaired. By reading the signals of RFID tags installed inside the tactile paving, this technology can provide voice instructions to lead the user through a smartphone. Other exhibits, such as a mobile phone application that works with a headphone for the hearing impaired, and an eight-seater driverless electric vehicle imported from the United States, are on display. A Japanese-made mechanical armour, commonly known as "construction site Iron Man" was introduced by which workers can use it to reduce the waist pressure by 15 kg while lifting heavy weights; a VR training on construction site safety; and a cute robot called Zero Carbon Boy which can interact with visitors are all of interest. There are many exquisite exhibits that I cannot cover all here, it is best for you to experience them in person.